We are one of the largest and most experienced providers of seniors rehabilitation, with services available across Canada. 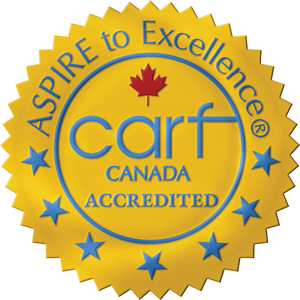 Achieving CARF Accreditation (Commission on the Accreditation of Rehabilitation Facilities) means that we have demonstrated a commitment to continuous quality improvement and the highest standards of business practices. We are the only long-term care rehabilitation provider in Ontario to achieve this. We source and analyze the same data that long-term care homes receive, and with it we create rehab-specific reporting that helps homes understand and improve their quality indicators. Our managers spend multiple days a year at client homes supporting both the therapy team and the staff through quality assurance and training. We help our customers meet the annual requirements for mandatory staff education and also promote wellness and exercise awareness to residents and families. We also have an extensive Nursing Restorative/Rehab training program to help you build your staff’s capabilities in this area. We know that residents in retirement homes can have difficulty accessing quality therapy and exercise programming without funding. We have worked with many homes to create service models that offer affordable options for on-going care. (*for those who completed a full episode of care – data collected from long-term care residents in 2015). We are the only company investing in new programs and tools to support our staff and customers. Supporting functional fitness and falls prevention, in partnership with the Canadian Centre for Activity and Aging. Clinical and administrative resources for therapy staff and home management. Makes it easier for our clients to access reporting and service information online. Integrates multiple sources of information, enhancing our quality assurance process for customer homes. Supports the episodic care funding model in long-term care.